After my epic plodding for the South Coast Run last August, (the latter stages of which involved some first-class dodging of mothers with prams and overweight balding men wondering aimlessly across the course), I decided I wanted to run/plod a proper half marathon, with a mapped-out course on blocked roads with cheering crowds. So I signed up to the Brighton Half Marathon. I didn’t start training until just after Christmas, which in hindsight was much too late. Although I’m reasonably fit (or a bit fit, hence FitBits) and do bootcamp/boxercise/Zumba 4-5 times a week, I don’t run enough and should’ve done more than two runs a week to train for this half. That might look like a lot of activity for one week, and I guess it is, but it’s definitely not enough running when training for a half marathon. I know this now. Not only did I not do enough running, but I didn’t do any interval or hill training to improve my pace or strength. Although this 10-miler training run was a really enjoyable one, on a really sunny day along the undercliff path on Brighton seafront, it was a slow pace and I could’ve picked it up a bit. I was much less nervous the night before and on the morning of the race than my first half – mainly because I knew I’d done the distance before so it wasn’t such a daunting prospect, but also because the crowds and atmosphere were electric and really boosted my confidence. Maybe a little too much though. After 2 emergency wees and lots of faffing about with my playlist and earphones I set off way too fast and as a result by mile 5 was already struggling. 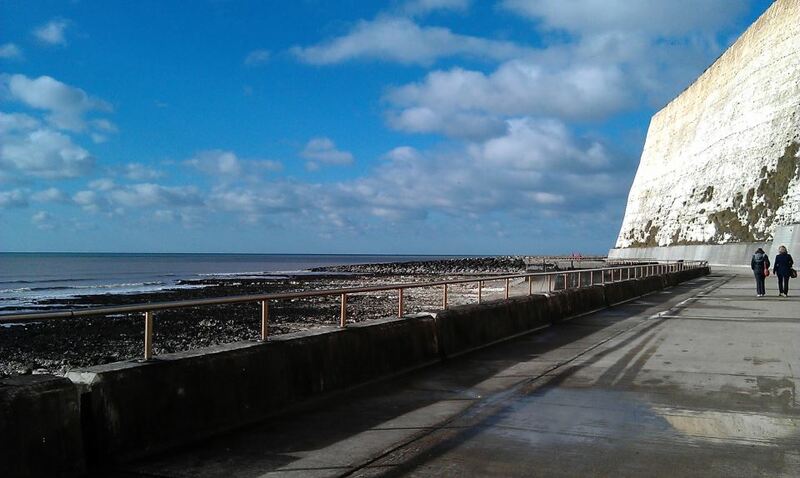 I remember running up to Rottingdean and after the first turning point (mile 4) I realised that this was gonna be a painful one. The view was beautiful running back down into Brighton along the top of the cliffs, so I sucked it up and kept plodding on, ignoring everyone else who was lapping me. By mile 9 I was going steady but when I saw my friends and realised that someone I wanted there hadn’t made it to cheer me on it suddenly became hard again and when I reached the turning point down by Hove Lagoon (which was a LOT further than I thought it was), I had to stop momentarily to stretch out my calves and back. This really pissed me off as I didn’t want to stop or walk any of it, I’d promised myself I’d run the whole way, no matter how much it hurt, so to stop and have to stretch was a real bummer. Once I got going again I just powered on for the last stretch – the wind was against us so that last stretch was bloody hard work, but the crowds were amazing and I just kept counting down in my head how long it was until the finish line. “Just another 15 minutes and I’ll be there”… “10 minutes left”. “Just keep going, don’t stop”. When I saw the first marker for the last km I was so relieved and excited so tried to pick my pace up a bit and finish on a high. Those markers make such a difference, and the cheers from either side really helped too. 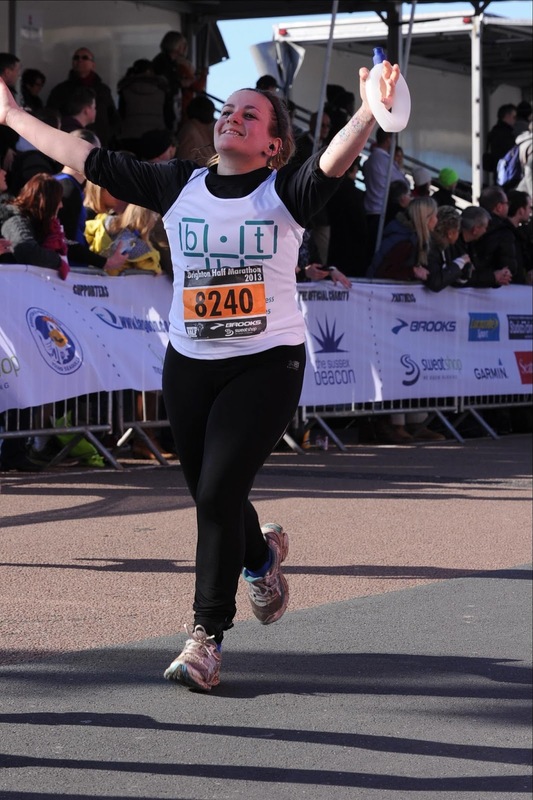 I think the race photo speaks for itself in terms of how relieved I was to have finished – that is pure joy etched on my pain-ridden, long-suffering face. DO MORE RUNNING IN TRAINING!!! Do interval training/hill running/speed work to improve pace/technique. Don’t set off too fast – people will always lap me, I need to get over it.